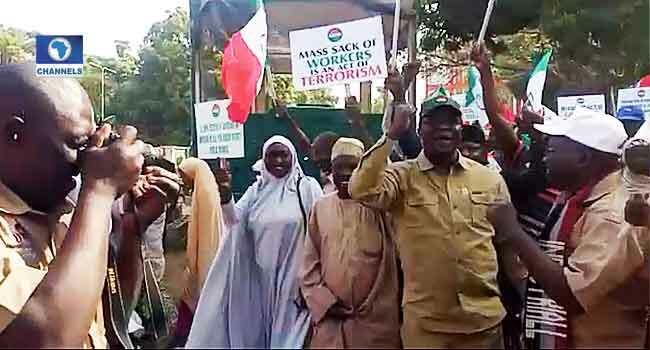 Members of the Nigeria Labour Congress (NLC) and the Nigeria Union of Teachers (NUT), on Thursday, went ahead with their protest in Kaduna despite warnings and tightened security by the Police. The protesters were seen marching through the major roads in the state capital and insisted on proceeding to the Government House, where they intend to submit their protest letter to the governor, Nasir El-Rufai. 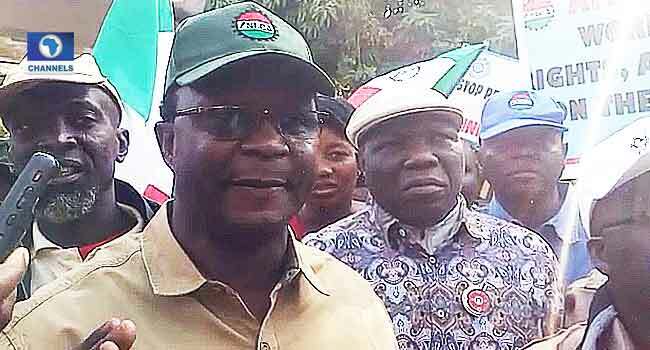 The National President of the NLC, Ayuba Philibus Wabba, said: the Police cannot deter us – people determined can never be defeated and therefore, we are determined, we will make our point. “We will submit our letter of protest, and if they like they should act but I think it is a welcome development because workers have seen that despite our olive hand of fellowship, to try to see how those issues are resolved on the table, we have seen that with impunity, the decision of the National Industrial Court is being set aside, with impunity, people are not allowed to exercise their freedom of association and this is not what we bargained for,” he added. This comes despite resistance by Policemen and other security operatives who mounted surveillance at major roads and the Nigeria Labour Congress (NLC) Secretariat in the state capital to prevent the Nigeria Union of Teachers (NUT), from going ahead with the protest. Policemen were also drafted along the Kaduna-Abuja highway to prevent NLC members from other states and the FCT from entering into Kaduna state for the anti-government protest. Briefing journalists, the state Commissioner of Police, Mr Agyole Abeh said the police were worried that hoodlums might want to take advantage of the public. He said, “We tried to speak with the leadership of this labour union for them to see reasons why it is completely dangerous because we are apprehensive that their intention is going to cause a breakdown of law and order because the hoodlums are likely to hijack it. “They insisted they are going to come out. They insisted that this march is a must. As you can see we have to manage this crisis with all caution because they blocked the public highway, they prevented lawful citizens from lawful movement and you know how long it took them to occupy this roundabout.